Since 1986, attorneys at the law firm of Renda & Voynick have been helping people and families in New Jersey to obtain justice and to recover full compensation in cases of serious personal injury or deadly accidents. High-level personal attention is our greatest asset. We choose to remain a small, focused law practice so that we can provide clients with more personal attention, accessibility, responsiveness and compassion. It also allows us to help clients resolve many of the non-legal issues that come up in connection with serious injuries. Our clients never have anything less than an attorney with 30 years of experience preparing their case and representing them throughout. In fact, both members of our firm are Certified Civil Trial Attorneys — a distinction held by fewer than five percent of attorneys statewide. 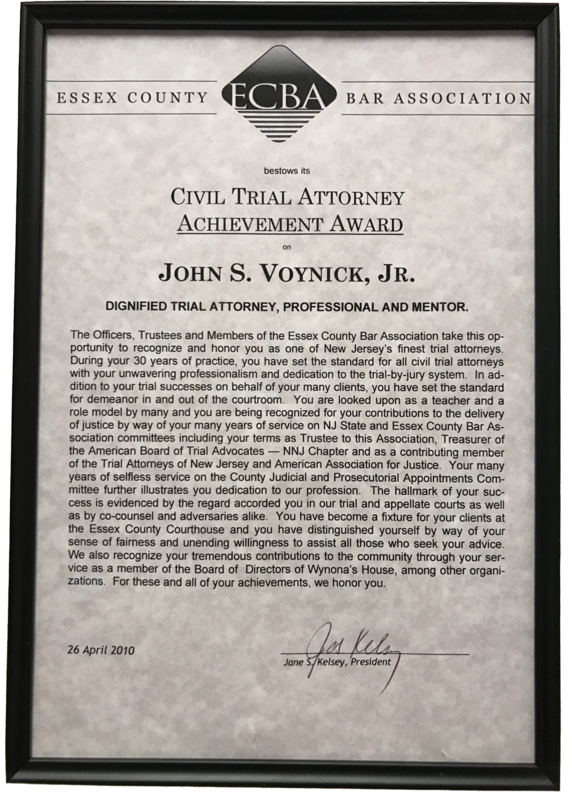 Each attorney also holds an *AV Rating and they have been recognized as New Jersey Super Lawyers every year that award has been given. Our lawyers began their careers defending personal injury claims for insurance companies. Today, our knowledge of what’s important to insurers and how insurers view and handle these cases are assets that benefit our clients tremendously. We know the other side’s arguments before they make them. We actually try cases and have a long track record of outstanding results in litigation. Not every firm can say this. In fact, there are relatively few. More importantly, although statistically most cases settle, if we cannot obtain what we feel is a full and fair recovery on behalf of a client, we recommend that the client proceed to trial. We are not afraid to take cases all the way to verdict. Besides our professional responsibility to our clients, we also feel we have a responsibility to the community and those who are disadvantaged and in need of support. 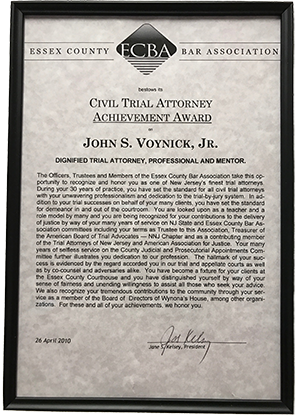 John S. Voynick, Jr., served for ten years as a voluntary officer of Wynona’s House which is a child abuse recovery center in Newark, New Jersey. Mr. Voynick also volunteered to serve as a mock trial instructor at St. Benedict’s Prep located in Newark, New Jersey for students aspiring to become lawyers and improve their communication skills and self-confidence. In addition to other charitable work, Andrew J. Renda, Jr. has served as a volunteer Little League coach in the community. He has also served as a volunteer for educational law programs conducted in various public schools. Mr. Renda has been a member of the local Chapters of the Chamber of Commerce for many years. Mr. Voynick and Mr. Renda also support local community charities. You have the right to know how many years of civil trial certification any attorney you consult has, and the number of million dollar recoveries he or she has made. Make sure you ask — you may be surprised at the lack of experience of other personal injury attorneys. The first step: Call our offices in Cedar Grove, New Jersey, at (973) 890-1040 or take a moment to complete the brief e-mail form provided on the Contact Us page of this Web site. Calls are answered promptly and if for some reason we can’t talk to you immediately — we will get in touch with you as soon as we can. Copyright 2017 Renda & Voynick | All Rights Reserved <------------------> Attorneys at Renda & Voynick represent personal injury victims throughout the Newark and Montclair areas of northern New Jersey, including Essex, Passaic, Bergen, Union and Morris counties, and cities or communities such as Montclair, Elizabeth, Union, Morristown, Clifton, Passaic, Cedar Grove, East Orange, West Orange, South Orange, Bloomfield, Roseland, Livingston, Parsippany, Wayne and Hackensack.